This 2 and 1/2 day class prepares the student to perform The Arvigo Techniques of Maya Abdominal Therapy® on him/herself only. Additionally, this class is a prerequisite to enrollment in the Professional Training for licensed healthcare practitioners. Self-Care Training covers anatomy and physiology of the abdominal and reproductive organs, addresses causes and symptoms of malpositioned organs and demonstrates self-care techniques. Self-Care also addresses herbal, nutritional, spiritual and emotional support for the massage techniques to ensure comprehensive understanding of the modality and how it contributes to wellness. Self-Care Training workshops are conducted by a Certified Arvigo® Self-Care Instructor. Vegetarian Lunch and Snacks provided. Price: £282.00 Plus USD$98 administrative fee* (*Administrative fee is payable directly to the Arvigo Institute at the time of registering for the course and is non-refundable. This covers course registration, student manual & a tithe to Ix Chel Tropical Research Foundation). The remainder of the fee is payable directly to the Hilary Lewin 1 week before class. Early Bird offer available: Pay £260.00 + administrative fee* if you register and pay the balance in full by 6th January 2018. Class fee includes Self-Care manual, and a 30-minute educational session with an Arvigo ® practitioner. Please bring lunch, plenty of snacks and drinks will be provided. Did you know that you can be peri-menopausal and fertile? Did you know your womb shrinks after menopause to an almost prepubescent size? Did you know that peri menopause can start in your early 40's and menopause is when you have not bled for a whole year? Learn how this transitional period in your life might affect you physically, emotionally and spiritually. Diamonds are created by immense pressure and time and are buried deep in the earth. As our wombs compress and ready them selves to cease bleeding I liken this to the creation of our own internal shining Diamond. Spend a day exploring your feelings around this subject whilst looking at how History and Society may have shaped our views. By digging deep into our own world we can unearth the treasure our wombs have created and appreciate all that has shaped us and all that is to come when we live in our own shining light. Understand what is actually happening to your body and various ways to support the process. Spend the day with women of a similar age and together we can rewrite the story of how a woman of a 'certain age' might look or behave. 'Apart from the huge wealth of knowledge from Hilary, spending time with so many women who are all dealing with the same life event, but each with their own story was empowering and gave me a wonderful sense of community. This event could only be improved by there being more of them. The Arvigo Techniques of Maya Abdominal Therapy (ATMAT) are an ancient healing therapy which use a non-invasive, external massage to improve the flow of blood, lymph and nerves throughout the body. The technique guides internal abdominal and pelvic organs into optimal position, relieving a variety of symptoms. What conditions can ATMAT help? Fibroids, fertility challenges, low back pain, endometriosis, painful and irregular periods, incontinence or sexual difficulties are some of the conditions we work with. Digestive complains such as IBS, indigestion or constipation may also be relieved with this therapy. This weekend workshop is for those who are searching for a way to find balance– physically, emotionally and spiritually. We will cover the anatomy and physiology of normal pelvic organs & structures. You will learn the Self Care abdominal massage and a holistic approach to health and wellness. Nutrition, meditation and herbal information will be included. You will be encouraged and have the opportunity to strengthen your connection with intuition, inspiration and creativity. You will develop a new understanding of your womb. The weekend is a nurturing opportunity for all who attendexpect laughter, tears and plenty of chat. This workshop is open to all and is the first step towards professional training. Learn to care for your self with this profound work. Hilary Lewin is a certified practitioner and teacher of ATMAT. She has worked closely with Dr Arvigo and teaches ATMAT at Professional level around the world. This course is for Self Care only and does not teach clinical application. It is a pre-requisite to Professional Care Training, Level 2. Instruction, manual, refreshments, a 30 minute personal evaluation and treatment. Its time to create a new image for the menopausal woman - be part of the rebranding at a Mining For Diamonds Workshop, 4th March 2017. As we approach menopause our wombs contract to an almost pre pubescent size. I compare this to ‘matter’ being compressed and the creation of diamonds. How can we create our own internal, shining diamond? What is our role as a menopausal woman? ‘Mining for Diamonds’ is the journey towards, through and beyond Menopause. Women who want to know more about the Peri/menopausal journey. Any woman late 30’s onwards. Those that are Peri or Post Menopausal and those of any age who have been medically menopaused for health reasons. Education is power and as the baby boomers come of age we are re writing the story. Crown your Crone and embrace your wise woman. Time to create a new image for the old woman, be part of the revolution! Symptoms and how to work with them. How diet and lifestyle may affect us. The Physiological and the Spiritual process. Relaxation, meditation and intention setting. Includes one hour lunch break. 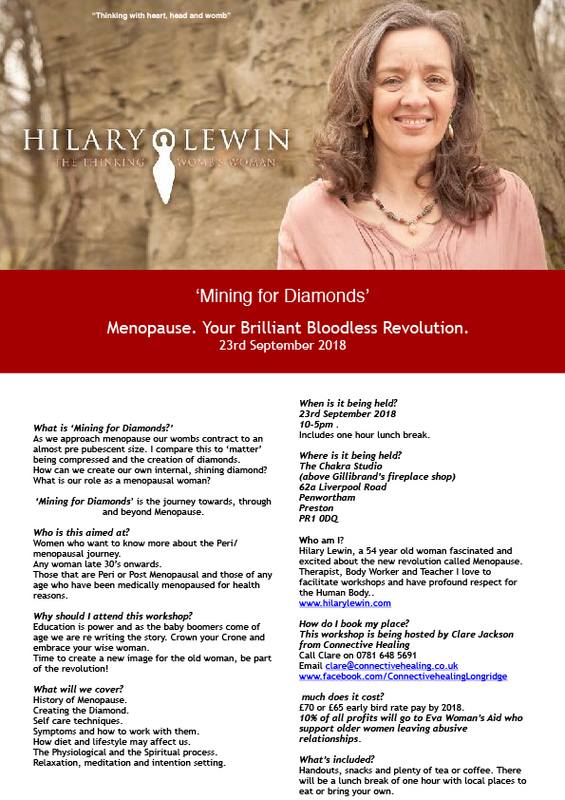 Hilary Lewin, a 52 year old woman fascinated and excited about the new revolution called Menopause. Therapist, Body Worker and Teacher I love to facilitate workshops and have a profound respect for all things womb related. 10% of all profits will go to Eva Woman’s Aid who support older women leaving abusive relationships. Handouts, snacks and plenty of tea or coffee. There will be a lunch break of one hour with local places to eat or bring your own. Fibroids, fertility challenges, low back pain, endometriosis, painful and irregular periods, incontinence or sexual difficulties are some of the conditions we work with. Digestive complains such as IBS, indigestion or constipation may also be relieved with this therapy. You will be encouraged and have the opportunity to strengthen your connection with intuition, inspiration and creativity. You will develop a new understanding of your womb and everything she can bring to you. The weekend is a nurturing opportunity for all who attend expect laughter, tears and plenty of chat. Hilary Lewin is a certified practitioner and teacher of ATMAT. She has worked closely with Dr Arvigo was responsible for bringing this training to Europe and teaches ATMAT at Professional level around the world. The total cost for the weekend is £320 Initially register your place by paying $98 via www.arvigotherapy.com you then pay the remainder £258 direct to Hilary. 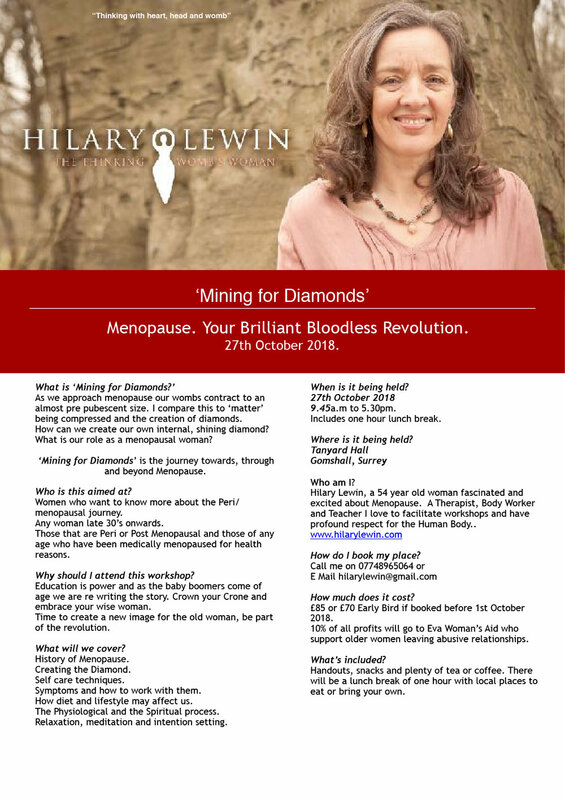 ‘Mining for Diamonds’ : Creating THE Menopause Manifesto. As we approach menopause our womb contracts to an almost pre-pubescent size. I compare this to ‘matter’ being compressed and the creation of diamonds. How can we create our own internal, shining diamond? What is our role as a menopausal woman? Women who want to know more about the Peri/menopauseal journey. Those that are Peri or Post Menopausal and those of any age who have been medically menopaused for health reasons. Education is power and as the baby boomers come of age we are re writing the story. Crown your Crone and embrace your wise woman. Time to create a new image for the old woman, be part of the revolution! June 18th, 10.30a.m to 4pm. Gomshall Station 3 min walk or easy, on site parking. I am Hilary Lewin, a 52 year old woman fascinated and excited about the new revolution called Menopause. Therapist, Body Worker and Teacher I love to facilitate workshops and have a profound respect for all things womb related. older women leaving abusive relationships. How the simple act of rubbing the belly can reduce stress, alleviate some of the symptoms of anxiety and create a relationship with the most important part of your body. Tools to increase your own and your client’s connection with the abdomen looking at anatomy, physiology and Reichian Armour bands. A simple self-care routine that can be practiced daily to relieve stress, improve digestive and reproductive health whilst making a connection between body and spirit. 1) All those that have a womb or have been in a womb. Those working with women who have sexual trauma, eating issues, hormonal issues, fertility issues some of which may be as a result of life style choices. 2) To understand the body through anatomy, how simply rubbing the belly can release the diaphragm and unlock a wide variety of conditions. How the womb holds trauma and ways to release it, the effects of transitional life phases such as puberty, birth and menopause on women. 3) Participants will be invited to share thoughts and feelings where appropriate, will learn a simple self-care massage for their own use, and receive handouts to take home. The presentation will comprise of a power point presentation, opportunity to practice simple self-care massage through clothes on to the abdomen, examples of where this work is appropriate and why, why self-care is the corner stone of all healthy life styles. This weekend workshop is for those who are searching for a way to find balance; physically, emotionally and spiritually. We will cover the anatomy and physiology of normal pelvic organs & structures. You will learn the Self Care abdominal massage and a holistic approach to health and wellness. Nutrition, meditation and herbal information will be included.